Crabtree Dental in Katy TX is committed to its patients in the Houston metropolitan area. We offer comprehensive dental care and want to ensure each patient has excellent dental health. If you live in the Katy area, it is wise to choose a local dentist for your family dentist. It will be easier and more convenient for every member of your family to come in for regular examinations and cleanings. Most busy parents don’t need the additional inconvenience of a long commute to a dental appointment. And what if you experience a dental emergency? 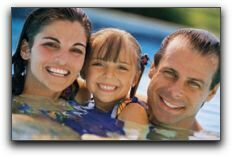 A local dentist who knows your family is best equipped to handle an unanticipated dental need. In addition to basic preventive dental health services such as fluoride treatments, routine x-rays and oral hygiene, we offer general and family dentistry. Parents with infants and toddlers often seek about thumb-sucking, the health of baby teeth, x-ray safety, and fluoride supplements. Parents with older children are often concerned about sealants, tooth protection for sports, tooth straightening, and dental financing. We look forward to answering all of your questions. Schedule your next dentist appointment with Crabtree Dental in Katy!